Fresh from an outstanding performance at the Doncaster Fesival, where Watson mixed it with the best, the 25-year-old schoolteacher proved he is the man of the moment. 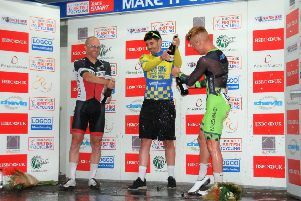 The Staveley-based Andy Moore Autocentres / J. E. James Racing Team rider was supported by a strong squad, including Andy Bishop, Steve Paterson, Harry Buxton, Jono Dexter and junior title holder Aaron Chambers-Smith. 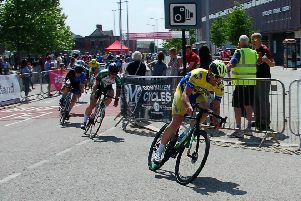 Watson claimed the victory in a stunning sprint finish and tops the riders’ list. Chambers-Smith was fifth and Paterson sixth. Team manager Andy Moore said: “At the pre-race meeting we covered the race plans in detail, and the lads did the perfect job. “Deano is performance perfection at the moment, and you could have bet your house on him to win that sprint. “His ride at Doncaster showed his capabilities, and with the dream team behind him on the road at Serlby he had the time of his life. “The lads are just brimming with confidence, and can’t put a wheel wrong right now. After a patient waiting game, Watson sprang the surprise attack into a fierce headwind that created the initial break. Two riders joined him, later to become one, while the team controlled the main bunch.